The focus of April’s Teen Science Café was Biomedical Technology. The speaker was Ms. Brittney Bender, Master’s Candidate in the Biomedical Technology Program at Morehouse School of Medicine. Ms. Bender started the café talking about her journey to becoming a STEM professional. How she enjoyed and was good at science all of her life. Ms. Bender is an Atlanta native but chose to attend a smaller college Albany State University to major in chemistry. After graduating from Albany State, Ms. Bender spent a few years as an analytical chemists at the Centers for Disease Control and Prevention (CDC). She decided to attend graduate school, where she studies Biomedical Technology in pursuit of her career interests in regulatory affairs. After speaking about her career journey, Ms. Bender talked about how innovation and science leads to discoveries that solves the world’s issues. She also shared the stories of STEM professionals whose inventions and/or research changed the world. 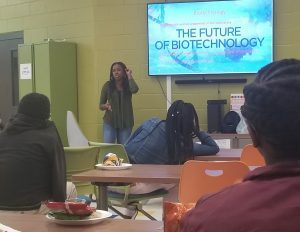 The coolest part of the café was when Ms. Bender provided examples of how modern technology and research are used to solve biological and medical problems in humans. She also explained that why the field that she plans to pursue after graduation, regulatory affairs is important and how it ensures that researchers and organizations remain ethical in their efforts to solve the world’s problems. 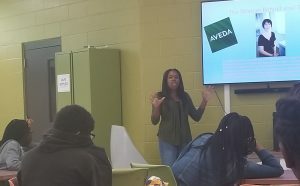 At the end of her presentation, before starting the hands on activity, Ms. Bender has a great conversation with the teens about their career goals. Due to confidentiality issues, Ms. Bender was unable to bring something connected to her field. So instead of focusing on Biomedical Technology for the hands on activity. Her hands on activity focused on showing the teens that Biomedical Technology and regulatory affairs work is interdisciplinary and requires the work of teams, with individuals with various expertise making their contribution to the project. 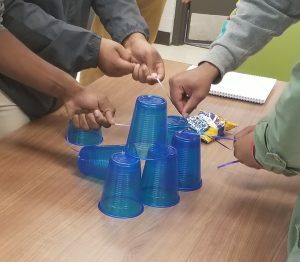 The team building exercise Ms. Bender engaged the kids in was on where they had to work together to build a pyramid made out of plastic cups but they couldn’t use there hands. This activity was great because each team finished at a different pace. The teams that took longer followed the rules as she stated and the teams that finished quicker took short cuts. In the wrap of the activity, she tied the activity to biomedical technology and regulatory affairs it is tempting to cut corners to go faster but one must be ethical and follow the rules.